Bariatric surgery is performed to treat obesity. Bariatric surgery is also known as weight-loss surgery. The most popular types of weight loss surgery are gastric banding and gastric bypass surgery. Gastric bypass surgery is done when the small intestine are shortened or re-routed to a smaller stomach pouch (gastric bypass surgery). 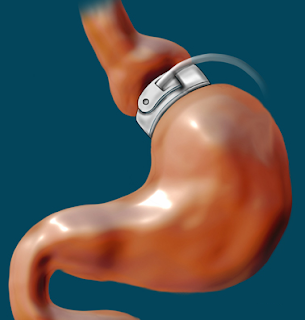 Gastric banding is done by implanting a medical device in the stomach to reduce the amount of food consumed. When the calorie intake is more than what the body burns, the unused calories are stored as fat by the body. If this goes unabated, fat keeps accumulating which causes obesity. Being overweight is different from being obese. Being overweight, which is also unhealthy for anyone, does not necessarily mean that the person has too much fat. An overweight person may be so because of extra muscles, heavier bones, or extra water in the body's system. Psychology is not a major factor in obesity. People who are obese do not consciously choose to be obese. More significant factors that affect obesity are changes in the environment where food is readily available and reduced physical activities. New research shows that people who have bariatric surgery to treat obesity report an overall improvement in quality of life issues after surgery, from their relationships to their medical conditions. Arizona State University researchers will present their findings at the 107th Annual Meeting of the American Sociological Association. Obesity is an epidemic in the United States with more than one-third of adults over age 20 classified as obese. Bariatric surgery is an increasingly common procedure that individuals are turning to that typically results in dramatic weight loss—sometimes of 100 pounds or more. According to the American Society for Metabolic and Bariatric Surgery, about 220,000 people underwent bariatric surgery in 2009 in the United States, up from about 13,300 procedures in 1998. The paper, "Social and Health Changes Following Bariatric Surgery," examines how patients who had the surgery fared afterward. The researchers collected data from 213 patients ranging in age from 26 to 73 years old, with an average age of 50, through a self-selected sample of participants in an online support group. "We thought there would be more negative reactions to the surgery, but the response was very positive," said study co-author Jennie Jacobs Kronenfeld, an ASU School of Social and Family Dynamics professor. "Most people had improvements in chronic health problems." Health issues that respondents reported improvements in included diabetes, heart disease, cholesterol level, and sleep apnea. Study respondents also cited increased mobility as one of the positive aspects of having surgery to lose weight. Weight loss among participants averaged 95 pounds per person while the range of weight experiences was wide—from a gain of 80 pounds, which is atypical according to the researchers, to a weight loss of 260 pounds. People who elected to have the surgery to reduce negative reactions to their weight among friends and family reported better relationships after surgery. Respondents also reported a decrease in depression after the surgery. "This provides evidence that overcoming the stigma of being overweight, as reflected by negative reactions of others, can lead to greater satisfaction among relationships with family and friends, and in social life in general," said Doris A. Palmer, co-author of the paper and a doctoral student in the School of Social and Family Dynamics sociology program at ASU. Satisfaction with how participants felt about their appearance was lower on average than satisfaction with other aspects after the surgery. "They were satisfied, but not as pleased about the way they looked as with other aspects of their lives," Kronenfeld said. "They may have hanging skin and those kinds of issues to deal with. It's not clear if most insurance companies will cover treatment of those issues since it may be considered cosmetic." Researchers asked a variety of questions in the survey that was made available through an online support group for bariatric patients. Study questions examined physical health, self esteem, social life, work life, family life, mobility, and satisfaction with surgery results. Motivators to have the surgery in order were: to decrease the risk of health problems; to improve overall health; to improve appearance; and to boost self esteem. Respondents also cited the ability to be physically active—for instance, being able to play on the floor with their children if they hadn't been able to manage that in the past when they were larger. Overcoming society's stigma of being overweight was another benefit respondents noted after losing weight.